By Kori ~ April 2nd, 2010. Hosted annually by the Washington Wine Commission, Taste Washington is dubbed â€œthe ultimate wine experience.â€ This past weekend brought Washington wine lovers from around the country to Seattle to drink, eat, and be merry. The event is a wine and food loverâ€™s paradise. The festivities kicked off on Friday with the Washington Wine Restaurant Awards, picked up steam on Saturday with Education Day, and launched into overdrive on Sunday when the doors opened at 2pm for the Grand Tasting. 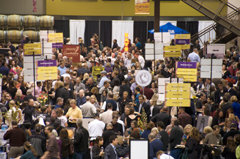 The Grand Tasting is the showcase event of Taste Washington. 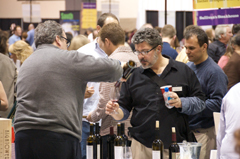 This yearâ€™s event featured over 200 wineries pouring their wines and over 60 restaurants serving small bites. With more than 650 wineries now open in the state of Washington, this event offers attendees the opportunity to try a large number of them in one place at one time. Considering the time and gas money you save not having to crisscross the state visiting tasting rooms and making appointments, the $125 for VIP tickets or $75 for general admission tickets is money well spent. Now, donâ€™t get me wrong, once you attend an event like this and discover some favorite new wines and wineries, you will definitely want to make plans to travel to the wineries to visit and taste again. There is nothing like spending a long weekend in Washington wine country. With 200+ wineries pouring close to 1,000 wines, it is impossible to taste all of them. Therefore, we always try to put together a â€œplan of attackâ€ before the event. This year we decided to focus on new wineries or wineries that were new to us. As I mentioned on Wednesday, we had the opportunity to get a head start and taste some wines during the trade tasting at the Restaurant Awards on Friday and a few more during the seminars on Saturday. Those wines along with the ones we tasted at the Grand Tasting on Sunday totaled 116 different wines. As youâ€™ll see from the complete breakdown of wines below, of those 116 wines, we rated 22 of them as 4-star quality or higher and 19 of them have a QPR rating of 5 bangs for your buck. As weâ€™ve said over and over: Washington State is producing outstanding wines that deliver the most bang for your buck. Of the wineries whose wines I had not tasted prior to this weekend, the most exciting discoveries were Tranche Cellars, a relatively new winery in Walla Walla affiliated with Corliss Estates, and Steppe Cellars, a winery located in Sunnyside that opened in 2005. One of the best aspects of Taste Washington is that often you will find either the winemaker and/or winery owner pouring that wineryâ€™s wines. We enjoyed the opportunity to visit with some of the winemakers/winery owners whose wines we have enjoyed in the past including Bob Betz of Betz Family Winery, Dean and Heather Neff of Nefarious Cellars, Mike and Karen Wade of Fielding Hills, Rich Funk of Saviah Cellars, Hugh and Kathy Shiels of Cote Bonneville, and Tim and Erica Blue of Adams Bench as well as meet a few who we had not had the chance to meet previously including Alex Golitzin of Quilceda Creek, Denise Slattery and Steve Michener of Trio Vintners, and Kay Simon of Chinook Wines. Hereâ€™s a breakdown of the wines that we tasted during the Taste Washington weekend. Under each Quality heading, the wine name and region will be listed along with price and QPR rating. Wines in bold type received a QPR rating of 5 bangs for your buck (out of 5). What wineries make the Seeing Red Cabernet, and The Surveyor. Great Review Peeps! I’ve been telling everyone I know and meet about Steppe Cellars. The one problem is they only make 1000-1200 cases per year and if folks find out about this place my share might get sold to somebody else. One thing that jumps off the page for me is that your top four 4 star wines can be purchased for $20 or less. That’s what QPR is all about. I tasted through a number of these wines as well and I just don’t agree with many of your selections. I would personally stick to critics with real credentials, not consumers trying to blog. Wonderful write up. Good idea, you guys spliting up to cover more ground. I enjoyed reading your perspective on some of the wines I tasted. I too enjoyed the Fielding Hills Cab Sauv & the Adams Bench V Cab. However, I am in love with the Agate Field Cab Franc which you only rated 3 out of 5. That is what is so great about the wine lover community, we each have our own tastes & preferences. Personally, I love reading about all people’s (whether a consumer or a professional) experiences with wine. It’s the way I learn and enrich my own experiences. Keep up the great work peeps! Seeing Red and The Surveyor are produced by the Cartel Wine Group. Sorry to let the cat out of the bag about Steppe. 🙂 I too was glad to see that there were four sub-$20 4 star wines. Thanks for seeing the value in our QPR ratings. I’m sorry to hear you feel that way. No one is going to agree with any wine reviewer 100% of the time. The most important thing is to find a reviewer to follow whose palate aligns with yours. Unfortunately, it sounds as if that is not mine for you, but I believe that it is for others. Thanks so much for your kind words. Glad to hear you enjoyed the Fielding Hills Cab and Adams Bench V Cab too. You are exactly right, though; the great thing about wine is that there is no right or wrong answer. Different people have different palates and that’s what keeps things interesting. Did you taste these at the Washington Wine Restaurant Awards? You are very observant. Thanks for reading the entire list. 🙂 The six non-Washington wines were wines we tasted during the Malbec and Value Challenge seminars on Saturday. Cheers! Reading your list makes me sad that I could not get around and taste more myself. What a great write up. Your focus and discipline is admirable. Now – while we are on the topic of pouring wine and discipline…I want to register my concern over how large I think the pours are at Taste WA and most other events of this sort. It seems crazy that the winery representatives pour so large an individual taste. I’m on a crusade to reduce this practice because I think it ruins most peoples palates, increases odds for over drinking and does not allow for more tasting and trying. I may sound like an old, drab, wet napkin here – but people need to minimize the oz’s in order to enable John Q. Public to experience more wine. OK – Rant done! Thanks! Thanks for your kind words. 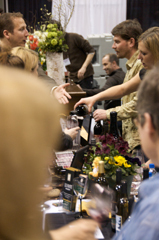 And, I appreciate your sharing your thoughts about the size of pours at large tasting events like Taste WA. You make great points. Unfortunately, I think part of the problem is that you get two very different kinds of people attending these events, the serious wine lover who wants to taste and learn and the not-so-serious consumer who just wants to drink and have a good time. The not-so-serious who are drinking without spitting won’t be able to discern what they are tasting after a few pours anyway. To your point, though, I’m not sure why the wineries would choose to pour such large pours anyway since they will probably either pour more wine than they would like or run out sooner than they need to. That’s one of the frustrating things for the serious wine lover who has taken the time to research and select the wineries they’d like to try only to find that they’ve run out of wine before the end of the event (possibly a result of the large pours you speak of). Not sure how this can be remedied though. Again, thanks for sharing your thoughts. Cheers!